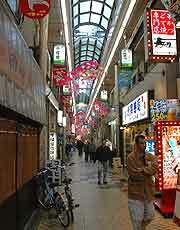 There are almost as many shopping opportunities in the city of Osaka as places to eat out. The best department stores can be found around the Umeda Stations and also in the JR Osaka area, where there is plenty to keep you occupied for your whole holiday. Osaka's shopping scene is known for its electronics and Den Den Town is a true highlight, where a huge selection of local stores specialise in electronic goods. It is worth bearing in mind that it is possible to avoid paying sales tax if the store features a tax-free sign. Tourists visiting Osaka and looking to take advantage of this saving should be sure to bring their passport when shopping. The general shopping hours in Osaka are fairly simple to predict, with the majority of shops around the city choosing to open seven days a week, from as early as 09:00, until 18:30 or slightly later. The main department stores usually tend to open at 10:00, with the smallest shops closing at around 17:00. Some of the city's smaller shops also remain closed each Sunday and many choose to close each Wednesday. 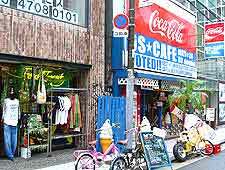 For food-related shopping in Osaka, the Doguya-suji Arcade is a good bet and is located in the Minami district, featuring around 40 shops in total. The city is almost over run with enormous shopping centres, malls and department stores, with highlights including the spreading ATC complex, where many popular shops stand alongside restaurants, cafes, waterfront attractions and entertainment venues, such as the ATC Hall. The America Village (Amerika-Mura) contains a huge selection of shops and restaurants, together with a number of popular love hotels. At the heart of Osaka's American-style Amerika-Mura district, the Big Street Shopping Mall is not to be missed and boasts nine floors of shops and more, including a cinema and many seasonal events. The nearby Triangle Park is also a good place to visit in this part of Osaka and features plenty of benches, where many people choose to take a much-needed break from shopping. One of the most popular shopping centres in Osaka is without doubt Namba City, an underground mall in the Minami area and close to Namba train station. With Japanese chain stores, inexpensive goods, many excellent restaurants and a maze of interconnecting halls, Namba City lies alongside the city hall and is also next to the Nannan Town, a further underground shopping complex. 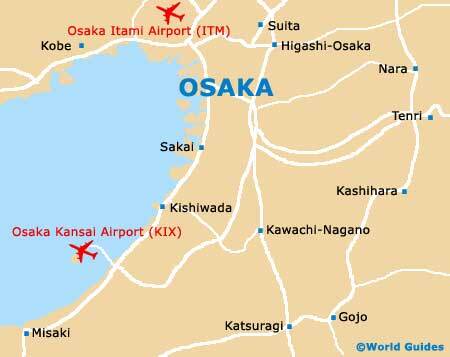 The main shopping malls and stores in the city of Osaka are shown below.